Oscillating in between sanctuaries of refinement, sophistication and precision every Rolex watch is the master of its craft for.The 100 years of mastery and watch making savoir-faire of Rolex offered us a rich collection of exceptional Rolex watches which combines the absolute high technical functionality with the mesmerizing sense of beauty.In the world of more than 400 registered Rolex often times a gentleman will be left dizzy with sheer breadth of variations and depth in each it’s collections.On the other hand, owning a Rolex Oyster Perpetual Air King watch is undeniably the greatest way to source the Rolex satisfaction. Air King Rolex happens to be the most alpha and masculine of the Rolex brand amidst the enticing lines and finesses of Rolex sports watches. It is because apart from the Rolex’s credible reliability and prestigious reputation, the Air King is engrained with rich heritage honoring the Royal Air Force for their incomparable service during the World War. The expedition of this sturdy ‘Air’ series starts in 1945 and comes with aeronautical heritage of paying tribute to the pilots who had fought in the World War II. To commemorate the RAF pilots, Air-Tiger, Air-Giants, Air-Lion were solely dedicated to the Royal Air Force. From then on, Air King Rolex has been the most coveted and cult-brands among the pilots all over the world. The evolution of Rolex Oyster Perpetual Air King series spans nearly half the century with continuous innovations and productions and at this era of 2018 Rolex Air King 116900 stands out from the rest with sturdiness setting benchmarks in terms of reliability and precision. Almost all of the Air King modifications come with colorful dial and strikingly colored hands making it reach a new era of sophistication. Similarly, the colorful variations of Air King bezels come up with silver, white, black and blue displays. The earlier The Air King series are known for being the oldest rare Rolex with distinguished history making them Vintage and highly prized collector’s pieces. Air King Date is known to be one such rare specimen. Rolex made a temporary halt to its Air King production in 2014 and at 2016, re-launched completely new counterparts with dramatic upgrades. Two things make the Rolex Air King 116900 so special and so talked about. One is the striking color combination of green Mercedes style hands and the eye-catching Rolex Logo engraved in a striking green and yellow color set on the distinctive black dial. Second this ideal entry-level model by Rolex comes with affordable price tag. 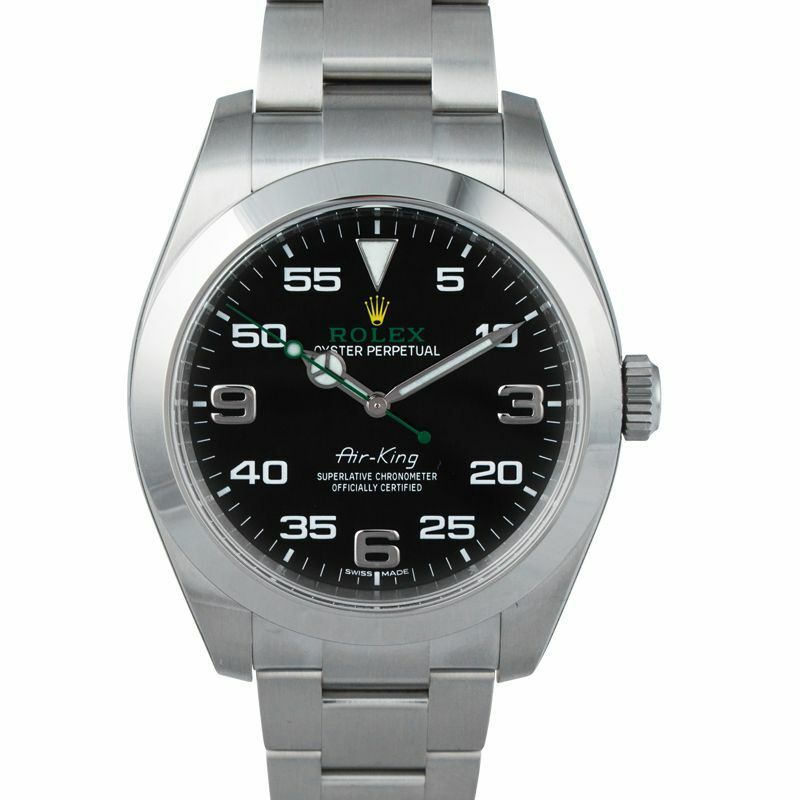 Air King 116900 is an absolute best buy in the Rolex catalog. 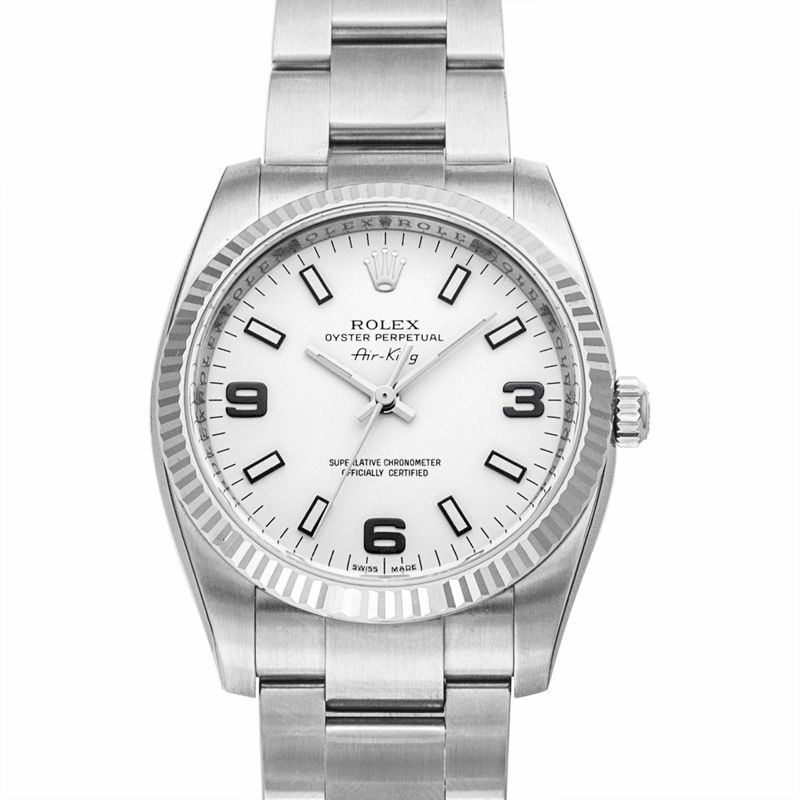 The Air King 14000 model comes with variety of straps options and the Oyster bracelet along with the embedded sapphire crystal makes it the perfect unisex Rolex model for both man and woman. All though Air King is known for being crafted with stainless steel, two rare and vintage Air King Models (5502 and 5506) introduced on the 1958 features Gold Plated 40 Microns. The Rolex Air King is meticulously curetted timepiece crafted with high quality workmanship and reinforces the aviation inspiration at its best. 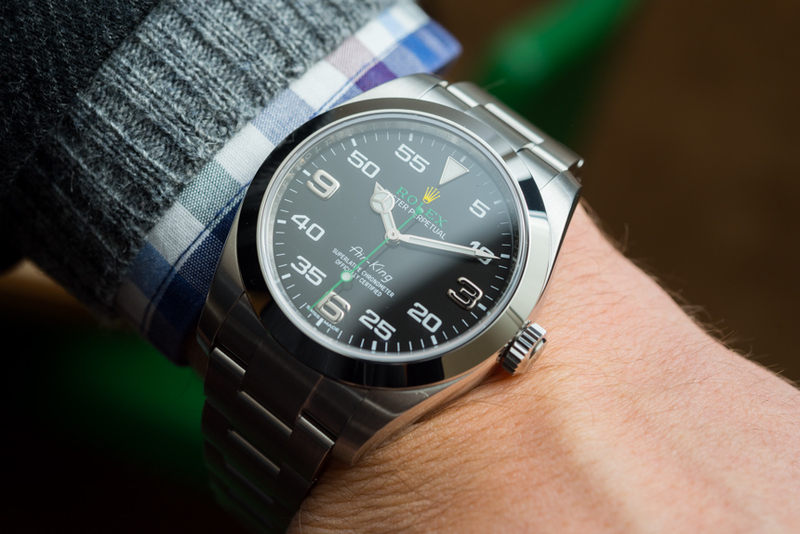 Resembling the Rolex Milgauss case, the wider 40 mm case and black dial encompasses silver Arabic numerals and a Chroma light triangular marker crowning the 12. The current model is anti magnetic and comes with waterproof to a depth of 300 feet and the sapphire crystal is scratchproof. Furthermore, the Air King is Rolex Superlative Chronometer certified rendering it the preciseness of aviation power-tool. To sum up, the black Rolex Air King is pristine with modern sporty look and is currently updated with dynamically design and functionality and indeed the aviation inspired timepiece is a true masterpiece of the Rolex.